To the Kids: Welcome to Essential Reads! Check out our reviews and/or add your own! We’ve removed our submit form for the moment as we were getting hit by spammers…if you want to submit, email us your review at gretchen@essentialmom.com. After you submit your review, I will need to preview it and post it to the site — it will not show up immediately, but I will email when it is on-line. There is a large age range reflected here, in general between the ages of 6-14, so browse the full list, there is a little something for everyone! Have fun and thanks in advance for your opinions! To the Parents: Below we’ll feature book picks from my favorite kids and if your children get so inspired, send us their picks too! We’ve removed our submit form for the moment as we were getting hit by spammers…if you want to submit, email us your review at gretchen@essentialmom.com. Terms and conditions? By submitting content, you agree that we can use your child’s words, content, and opinions on EssentialMom. If you want to motivate YOUR kids to write — let them have at it here! Even if you see another review of the same book, feel free to submit, we’d be happy to feature a variety of opinions. We’ve removed our submit form for the moment as we were getting hit by spammers…if you want to submit, email us your review at gretchen@essentialmom.com. If you’re child is not a crazy reader (yet) — read up on our suggestions on encouraging them and getting started on the path to making them life-long readers. Click here. And for the slightly younger set — our preschool book favorites. Click here. Little Joe’s Books, a great bookstore for kids and teens in Katonah, NY. 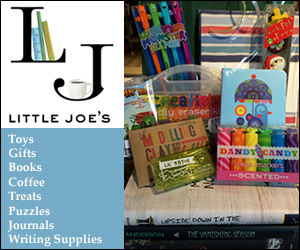 Little Joe’s is the only bookstore devoted just to young readers in Northern Westchester and carries 1000s of titles, along with games, toys and puzzles. They host regular in-store events, including a weekly “Story Hour With Miss Kathy”, a monthly series “Reading with Whoopsie Daisy, the Reading Dog”, and frequent author visits and book signings, special-themed parties, and more. See below for reviews from “friends at Little Joe’s” (kids who frequent the store) or the Pick of the Month from Genevieve – Little Joe’s fabulous and knowledgeable book source. Visit www.littlejoesbooks.com, or find them on facebook. Visit our Library Page to find your local library or go to www.summerreadingnys.org for suggested book lists, games, and resources. The book is about 4 kids: Benny, Violet Jessie and Henry. Benny is 5 years old. Violet looks around 8 years old. And Jessie and Henry look around 12 years old. The story is about the 4 of them going on many fun experiences. In the beginning there was a big snow storm and a family was driving across country and ended up stranded on the 4 kids’ road. The stranded family went up to the 4 kids’ door and asked to stay for awhile. In the family there were two kids and they were close in age to the 4 kids. Their names were Meg and William. They had a puppy named Joe. Benny loved Joe, they were best friends. Meg and William’s parent’s names are Sarah and Jake. The family stayed for a long time because their car broke down. The six kids loved playing together. They even made a circus. Then a little bit later the piece Jake needed to fix his car arrived. That meant they could journey back home. The kids were very sad to leave each other but then they remember that they would be back in town next year to visit. They all said goodbye and they were off. Later that day Mama and Papa set out to deliver treats. Then they did not return their neighbor Rubin and the police came down to their house and said that their parents had been killed in a bad car accident. The kids were very sad. They didn’t want to be separated so they ran away. They wanted to go visit Meg, William, Sarah, Jake and Joe and so they were off. A significantly emotional retelling of a boy who joins the army during the Vietnam War and his role as a dog-handler — told from the perspective of the dog and the man. This is a great novel about the love between a man and his dog, the fear and craziness of war, and a tale of courage and bravery on both sides. A book about a boy who is afraid of eleven. With the help of Caroline he learns what eleven means and why he is afraid of it. This is a great book for kids (8 +) who like mystery. Hank, a lovable but goofy ranch dog, is the narrator in these tales of adventure. Hank “polices” the farm and talks about the ways in which he is often called on to “save the day” around the homestead. He is just funny enough for adults to get a giggle, and goofy enough for kids to understand his silly exaggerations. Hank is a completely lovable character and the books are a joy to read. A beautiful book about a boy’s quest for ‘the meaning of life’ as he approaches his thirteenth birthday. His deceased father has left him a locked box and he must follow adventures to find the key and get it open in time for his birthday. It is a stunning story about loss, friendship, and the people who surround you in life. This is the perfect first experience with chapter books for kids — either read them out-loud to younger kids or, for children who are ready for more of a challenge, they can be read alone. There are TONS in the series, and each covers a very different story line (and you can read them out of order). The main characters are siblings, Jack and Annie, who discover a magic tree house filled with books — and each book allows them to travel to a different time, leading to many historically based adventures, so a little something new in every book. Main characters are Sam Temple, Caine Soren, Astrid Ellison, Pete Ellison, Dekka Talent, Brianna, Drake Merwin, the Darkness. In the first book of the series (Gone), all adults disappear from an area in California with a 20 mile radius. A barrier forms so that the people who are left inside cannot escape in any way, and the children are left to fend for themselves. Leading up to Plague in the series, many essential things are slowly taken away from the kids inside. Things such as food, electricity, and water are scarce and illness and internal conflict are abundant and dangerous, with many of the children dying. However, the children start to develop impossible powers such as teleportation, lightning speed, telekinesis, the ability to cancel gravity, and the power to shoot light from their hands. These powers help to keep the kids safe and can be beneficial, but can also be bad if in the wrong hands. In Plague, the 4th book in the series, a deadly illness strikes Perdido Beach, the town inside the barrier, and starts to slowly wipe out the people infected. While all of this is happening, an unstoppable species of giant bugs begin to develop with the help of the Darkness, an evil creature buried in a mine shaft. The bugs attack the town under the command of Drake Merwin, a psychopath who hopes to kill everyone in Perdido Beach. Caine Soren comes from his home on an island offshore but still inside the barrier to help defeat the bugs, and is successful. While this happens, Sam Temple is on a mission to find food, water, and a new place to settle to get away from what is by now a ghost town in Perdido Beach. As a result, he is not there to help when the town is attacked, but in the end, his journey is extremely beneficial to the kids who decide to move to the place he found. I loved this book as much as any of the previous 3 because it was similar in that it was full of action and interesting the whole way through, but it was not poorly written so that it was not interesting to read and learn from. I dislike books that fill themselves with intrigue, only to completely mess it all up for me by not being well-written. These books are a perfect balance for me and every single one satisfies. I will surely finish the series. Cara’s moving to a new school for high school and she and her best friends make a pact to figure out how to become one of “those girls” at the new school — stylish, popular, and ready to enter a new world socially. The experiment starts to work and you watch as Cara navigates a new social life that she alternately loves and hates, while you love and hate HER as a character. Interesting twists and turns, humor, and a peek (or a reminder) of the world of high school girls — ouch. Contains some more high school appropriate content. This book is about a secret team of agents on the RBI team who are from Ripley high school and are on a mission to report back to base about a sighting of a lizard creature. While on the mission they are chased by a group of agents from DUL, RBI’s enemies. This book is about a young girl about 13 who moves to London to get away from the government watch list which her parents are on. She then meets a boy about the same age as her who’s father is an apothecary and together figure a whole lot of things they didn’t know while being chased by a group of soviet spies. A classic book set that continues to resonate with children today. Four orphaned siblings run away and live together in an abandoned train car — the stories detail their adventures, their relationships, and how they learn to survive on their own.